At eighteen, Stacie was living the life of a typical college student; attending classes, hanging out with new friends, having fun, and maybe checking out a college party or two. The one difference was that her roommate kept complaining of her frequent coughing in the night, and when she went home for breaks, her parents also noticed that she was coughing a lot. So Stacie visited the doctor. Subsequently, she was misdiagnosed with lymphoma. She had a biopsy and a hospital stay that was prolonged due to complications. Stacie finished her freshman year of college and that same month she learned that she was diagnosed with diabetes. Then, that July, her parents received a card in the mail from the CF Foundation, detailing the symptoms of cystic fibrosis. Sure enough, those symptoms matched the those that Stacie had lived with her whole life: difficulty gaining weight, clubbed fingernails, and digestive problems. 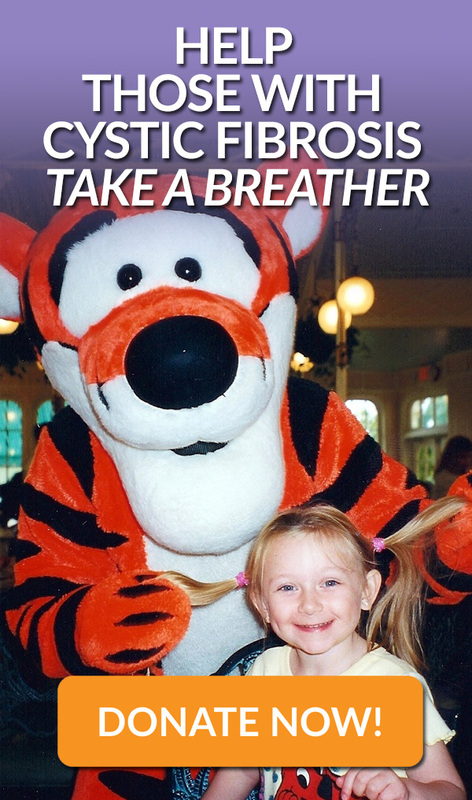 Stacie had a sweat test at the Children’s Hospital of Philadelphia and her suspicions were confirmed: at age eighteen Stacie was diagnosed with cystic fibrosis. Everything changed. Stacey had begun her new way of life, as she later realized. Changes included regiments of enzymes, and IV and breathing treatments. She kept her medication in the college medical center because her refrigerator was too small. She provided countless explanations to teachers, friends, and peers about her new lifestyle. She changed her early childhood education major because it would mean too much time with children and an increased likelihood of getting sick, something she could not jeopardize with her disease. Yet Stacie adapted, graduating on to new stages of life. When Stacie pursued her first job, she looked for those with “good to great healthcare benefits”, and managers and a schedule that would be at least “mostly accommodating” of her treatments and doctor visits. Stacie describes how she crammed to work during lunches and after hours to compensate for her hours-long absences due to treatments and doctors’ appointments. When Stacie became pregnant with her daughter, Emma, she was thrilled. But she soon realized that her first pregnancy would be her only one. Stacie describes how she was hospitalized (at least?) once each month of her pregnancy due to complications. Stacie felt a sense of guilt when family and friends helped her care for Emma, believing “it wasn’t their responsibility.” But Emma is Stacie’s priority; Stacie plans her appointments around Emma’s busy schedule (as the younger is now sixteen). Stacie describes how she can now longer physically keep up with Emma, who slows down to be with her mother. Emma helps her carry the groceries, do IV treatments, because as Stacie describes, even the simplest of tasks, like vacuuming, can be difficult. 2016 was an especially difficult year for Stacie. She was hospitalized three different times and in addition to medical strains, Stacie was in the process of a divorce and moving out of her home. So when Stacie received a call from Molly at Take A Breather, she was overjoyed; she described how both she and her daughter “cried when they presented us with the wish”. Stacie had received a unanimous nomination for her wish from her CF care team. When it was time to decide on her wish, Stacie and Emma knew immediately that they wanted to take a Disney Cruise. It was something “they had often talked about”. It would mean a manageable amount of walking for Stacie and a healthy dose of Disney for the self-proclaimed “huge fans”. Stacie describes how their cruise was “the BEST trip ever. It was an added thrill riding to and from the airport in a limo. Emma and I had an amazing time. The cruise was spectacular. I felt like we had escaped reality for 7 days and it was fabulous. We had so much fun doing all the activities the ship had to offer and we did them all together from drawing to trivia to movies. It was just as much fun as going to Disney World but without all the walking (which was great for me!!) It truly was an incredible experience that neither of us will ever forget! We owe all of our thanks to the Take A Breather Foundation for allowing me to take a breather from both CF and reality!!! Stacie and her daughter will bring home their memories of an “experience that neither of [them] will ever forget.” And while the pair will no longer be cruising the Atlantic, they’ll surely keep supporting one another, taking “mini-breathers” on day trips to museums or to the zoo. We hope the unforgettable memories don’t stop, and we’re happy to provide the opportunity to relax and forget their cares for a while!